S.C.C Racing is a small family run classic racing outfit, created in 2012. It was started and is run by our main rider, Lee Clare - who got into classic racing that same year. Lee is helped by various family members and friends, (specifically his parents and wife Natalie) with all aspects of his racing. Going racing is no easy thing, even club racing. It requires drive, tenacity, energy and dedication from those involved. Everyone involved all play a part in getting the bikes to meetings race prepared, and ensure each weekend run's as smoothly as possible. 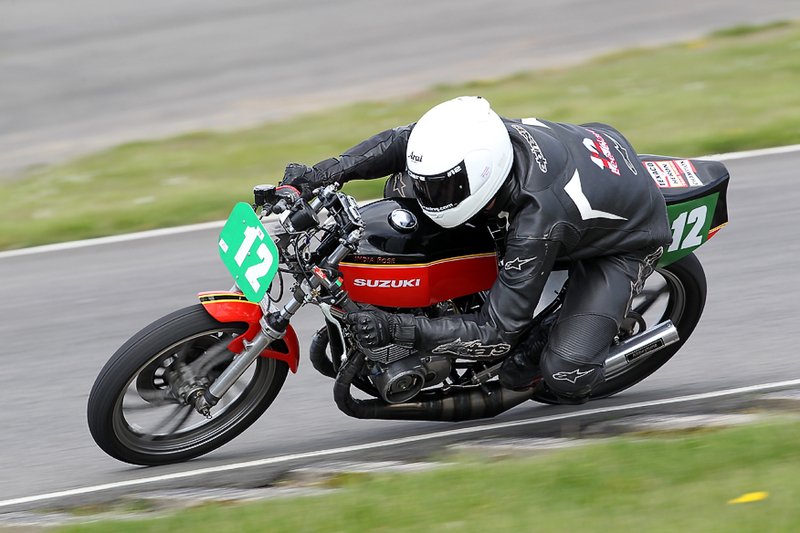 We are doing most of our racing with the Classic Racing Motorcycle Club (CRMC), competing in various classes including the Post Classic 250cc Aircooled clubman clas, the Post Classic 750 clubman class and the classic 350 Twins. Lee also compete's at Aberdare Park which is part of the 'proper road' race calendar, and will look to race at other proper road meetings in the future. Please browse through the site to find out more detail on us, our bikes and our results. Hopefully you will find the site interesting, if so please visit us again and recommend the the site to friends. There will be regular updates made, so keep re-visiting us regularly. We have a Facebook group for SCC-Racing, so please log on and 'like' our page to keep up with updates / posts and pictures. 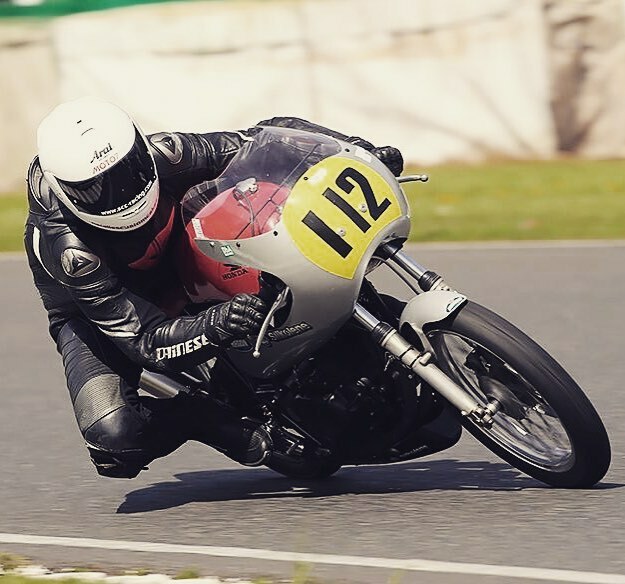 Lee started racing in 2012 on board his first ever race bike which was 1979 Suzuki GT 250 X7. 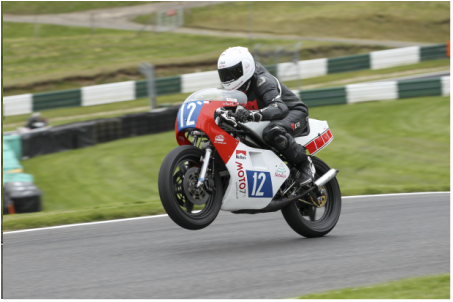 We entered the little 250 into the Aircooled 500 class, and although the X7 was always going to struggle up against big 500cc bikes in the class - he thoroughly enjoyed the season's racing. He finished the 2012 season 6th in the AC championship, which was a credit to the reliability of the bike and also Lee's efforts into getting to grips with racing in his first season. He earned sufficient race finishes to get rid of his orange novice bib, and really caught the bug in that first season. As the seasons have gone by we have got progressively quicker on the 250 and also now competing in multiple classes at most race meetings. Lee raced at Aberdare Park for the first time in 2013 - his first taste of 'road racing'. Since then we have been back to Aberdare every year, and recorded Lee's first national road race win at the Park on Nige Colliers 350 Honda and now count it as our favourite event of the season. Having been offered rides on various different bikes in different classes, Lee now has experience riding a 4 stroke 350 Honda twin, 250 & 350cc 2 strokes and a big 500cc 4 stroke single. Amongst all this racing, Lee has recorded class and outright race wins on his 250, and several podiums on the Harris 350. Best championship result was a 2nd in the AC250 class in 2014. Away from motorcycle racing Lee enjoys training for and racing triathlon at various distances. Classic Racing - what's it all about..?